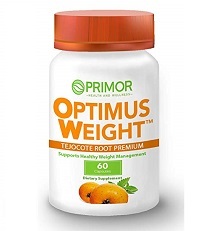 Optimus Weight is a non-prescription diet pill made by a company called Primor. The official website is partially in English and partially in Spanish, which can make it somewhat confusing for either English-only or Spanish-only speakers. For that reason, the information used for the writing of this review is primarily gleaned from the official website, but also includes the product package and certain other retailers that sell these diet pills online. Optimus Weight markets itself as a 100 percent natural formula that will help dieters to “lose weight in an easy and natural way.” It directly claims that it will produce results “Without Diet. Without exercise and Without Rebound.” Immediately, any dieter who sees these types of claims should also see a red flag. As of yet, there isn’t a pill on the market – either non-prescription or prescription – that can honestly say it is proven to produce weight loss without any lifestyle changes. Therefore, it is highly unlikely that dieters will be fully satisfied with the fat loss they experience through the use of this product. It is extremely highly recommended that anyone considering the use of Optimus Weight first discuss it with a licensed medical professional. The dubious marketing and untrustworthy claims made about this product make it very important that a health care expert advise anyone who is thinking of taking these pills. At the time this review was written, the ingredients listed on the product package for Optimus Weight include: Spirulina (Spirulina Maxima), Tejocote Root (Crataegus Mexicana), Dietary Fiber. By taking a closer look at those ingredients it becomes immediately clear that this is not meant to help dieters to lose fat. Instead, it is a laxative that will promote more frequent bowel movements. If any weight is lost on the scale after using this product, it will only be because of temporary dehydration and an emptied bowel. Interestingly, despite the fact that these ingredients – especially dietary fiber – are very well known for this result, the description simply says that the spirulina helps control appetite, the tejocote root “cleans and detoxifies your organism, evacuating accumulated fat,” and the fiber improves digestion. This is either a deliberate form of misinformation or illustrates the strong lack of understanding of how the digestive system works and how the body burns fat. No significant fat loss has been associated with supplementing these ingredients in any published medical studies in industry journals. Instead, temporary lost pounds will be the result of lost water weight. That weight can return as quickly as a few hours later once the dieter rehydrates and has anything at all to eat.